January is over, and I'm done working on Rocks! (for now, at least), and it's time to go over what worked, what didn't, and what I'll do differently for February. This was the first month of the One Game A Month challenge, and I really wanted to make sure I finished something, so I'd get started off on the right foot. To that end, I tried to shrink the scale of what I was trying to do for January to something I was sure I'd be able to finish. Rather than design a game from scratch, I started with a well-known design, and implemented it on an unknown (to me) technology stack. 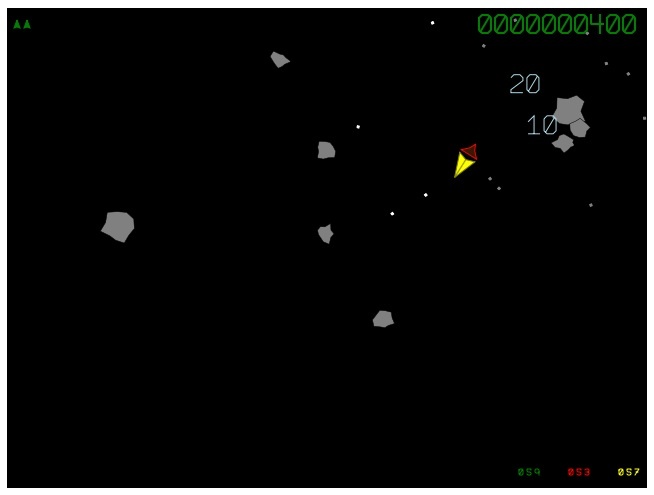 So, I decided to do a clone of Asteroids, running in the web browser, using the canvas element for graphics, and the Web Audio API for sound. I wanted to produce something with a retro feel, true to the spirit of the original, even if it wasn't exactly the same in execution. And I decided to do the whole thing without the use of any frameworks or libraries, both because I thought that the game was simple enough that I could just bang it out without much help, and because I wanted to actually learn the browser APIs, not some third-party library. By the end of the first week, I had a playable game, if not a very interesting one. That took a lot of the pressure off, knowing that even if I ran out of time, I'd have *something* to show for it. Although lots of really great ideas came to me while working on Rocks!, I managed to avoid the temptation to add in a bunch of extra features. I feel especially good about this given that I didn't quite meet the initial goals - I'd have felt a lot worse if I didn't manage to make a complete game, because I'd gotten distracted by doing something cool, but not part of the core gameplay. I spent a fair amount of time tweaking the controls, to get ship movement that felt "right". I think this is something that really distinguishes my game from the other Asteroids-like games that were submitted to OneGameAMonth last month. My ship is very responsive, it turns and accelerates quickly enough to get out of trouble, which makes the player feel like they're in control of their own fate. I didn't want to spend a lot of time drawing terrible art that I then hated. I figured that going with the vector approach would encourage (enforce?) a simple graphical design, and save me from spending hours tweaking art trying to make it look less goofy. My inability to draw well is going to be an ongoing issue for the next 11 games, too. Actually a bit ahead of time. Which is good, because a bunch of "real world" stuff came up in the last few weeks of January. Despite the fact that I went with a totally minimalist look & sound, I still had to do a fair amount of tweaking. But with everything defined in code (see next item), it was pure tedium to make any changes in the graphics or sound. I ended up doing the entire art design by sketching things out on graph paper and manually copying down the coordinates into my code. This wasn't *terrible*, but it was tedious and error-prone. I didn't produce an editor for shapes and sounds because that sounded like more work than actually finishing the game. For *this* game, that was arguably true - but a couple of features got left out, rather than going through the process of manually designing graphics & sound for them. I'm planning on using the same technologies in future games, so I'll be able to amortize the effort to produce the tools over several projects. Conveniently enough, the optional theme element for OneGameAMonth February is "sound", so I'll have good incentive to build (or find) at least a rudimentary sound editor. These are all things I intended to do, but just didn't get around to. Technically, there is a high-score board, it just doesn't allow you to put in your initials. This is because I didn't feel like I could implement it without needing to make some major changes somewhere else. 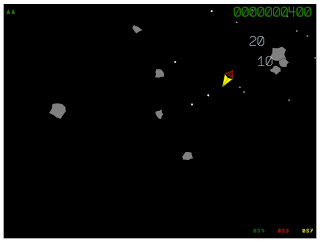 Enemies were going to be UFOs like in Asteroids, with an occasional power-up coming from each enemy shot down. I think I could get a fairly rudimentary version of alien AI done in a couple of days, but I just ran out of time. February will be crazy busy for me, so I'll be setting my sights low for this month as well. The massively-multiplayer infinite-world Sci-Fi adventure game will have to wait a month or two. Amongst other things, I will be adopting some helpful libraries and/or frameworks, rather than trying to do everything myself. In particular, it'd be an interesting exercise to build a videogame using the Enyo.js framework, since we've never really pushed that particular use case, Enyo being more focused toward native-equivalent mobile productivity apps.